When we returned home we were tired, so we did the cook’s equivalent of that old housekeeper’s trick, “sweeping the dirt under the carpet.” Well, it’s not THAT bad. We decided to wash the messy pyrex baking dish in the morning — after we slept on it, so to speak. So we stuck the dish into the oven, where we wouldn’t have to look at it. Bad move! Who wants to wake up to a messy dish in the sink? Not us, which is why we hid it. Honest, we were going to wash it the first thing when we got up the next morning. Only we hid it a little too well. 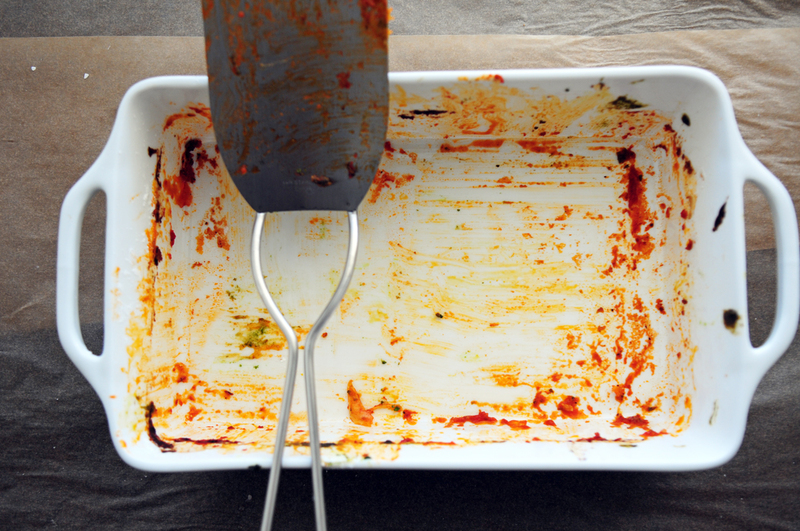 “Out of sight, out of mind.” We didn’t give that dirty dish a second thought! Not the next day, when we were busy writing; nor the next, when we ran errands; nor the day after that, when we … well, long story short, we didn’t use our oven for days! Sure, we cooked on top the range, but we didn’t need to bake anything. When we finally did open the oven, to look for the pizza pan — What? You don’t store your pizza pan in the oven? Ours won’t fit anywhere else! — we were confronted by that messy baking dish. Sitting there. Alone. In the dark. Sulking. Hardening the cheese and sauce of its aching heart … until all that was left was a dried up, crusted over scab of forgotten ziti. Okay, we’re being dramatic. But the cheesy residue of our long-forgotten meal was almost impossible to clean up. We destroyed our kitchen sponge, using the coarse side of it to scour the dish — and to no affect. That cheese had hardened to cement. A jackhammer wouldn’t have been totally out of the question, but we settled on an SOS steel-wool pad and several minutes of hard labor. A just penalty befitting our crime of neglect and forgetfulness. And then — yuck! — we needed to toss out the SOS pad! In life, just as in dirty dishes, we all face problems that are much easier to handle when dealt with quickly. Sooner or later, we all manage to make a mess of something, and it’s a lot easier to clean up our messes when we deal with them immediately. Hiding from an issue, avoiding an unpleasant task, leaving a hurt friend or family member to “harden” while we “sleep on it,” only makes the job more difficult — if not impossible to handle. Take care of your cheesy messes before the job gets tougher. Don’t put it off. Don’t talk yourself out of it. Things will just get harder. Do it quickly, so both your dishes and your relationships will sparkle.